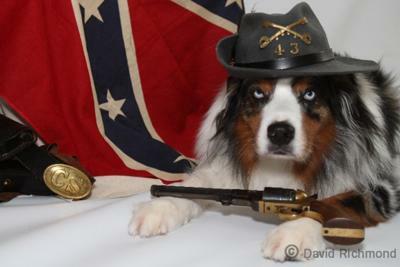 I did a photo shoot of my Aussie using some of my Civil War gear for props. This is my Favorite. Standing guard 43rd Va. Mosby's Partiasian Rangers The Greyghost. He did a very good job posing for me. I just love those Aussies. You give them a job to do and they do it. If you know about the Civil War Mosby's Rangers, this is where he got his name and title. He is now part of the Civil War Heritage. I would like to thank all of you for your comments. This is my favorite photo of Mosby. I found his nitch he loves to be with me and in front of the camera You know Aussies they always want the center of attention. Thanks again guys. What a beautiful Aussie! His color is striking! There is just something about an Aussie. Great picture. Awesome picture I really luv those piercing eyes.